Robin Hyde was the pen name of Iris Wilkinson. 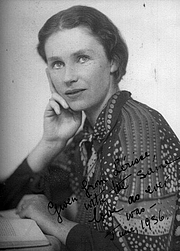 Robin Hyde was the pen name of Iris Wilkinson, born in Cape Town, South Africa, to an English father and an Australian mother. When she was still a baby, the family immigrated to Wellington, New Zealand. She began writing poetry as a child. She attended Wellington Girls' College, and published short stories and poems in the school magazine. She also began submitting her work to New Zealand and Australian publications. After graduating, she briefly attended Victoria University of Wellington. At age 18, she had repeated knee surgeries that resulted in a permanent disability and dependency on painkillers. In 1925, she became a reporter for the conservative Dominion newspaper, mostly writing for the women's pages. The following year, at age 20, she resigned from the newspaper after discovering she was pregnant from a love affair, and moved to Sydney, Australia. There she had a stillborn son whom she named Robin Hyde, later taking the name as her pseudonym. She returned to New Zealand, where she had a breakdown and was hospitalized for some months. When she began to write again, her poems were accepted by several New Zealand newspapers in 1927. She was also hired to write for the Christchurch Sun, and the Mirror, but was frustrated at being sidelined to social columns, experiences that led to her book Journalese (1934). In 1929, she published her first book of poetry, The Desolate Star. She later became an editor at the New Zealand Observer and wrote on a variety of issues and topics. In 1933 she tried to drown herself and was hospitalized again for four years, during which she continued to write. She published five novels in the ensuing years: Passport to Hell (1936), Check To Your King (1936), Wednesday's Children (1937), Nor the Years Condemn (1938), and semi-autobiographical The Godwits Fly (1938). In 1938, Hyde resolved to travel by ship to England to seek experience and recognition and to meet her publishers. From a stop-over in Hong Kong, she visited Shanghai and Canton, then under Japanese occupation. Some of her finest poems and numerous articles emerged from this extraordinary journey into a war zone. She was assaulted by Japanese soldiers and sustained a painful eye injury. Eventually she managed to reach England in September 1938. Although ill and penniless, she became involved in the China Campaign Committee, the Left Book Club and the Suffragette Fellowship. She was in and out of hospitals, suffering from depression, dysentery and anemia. Robin Hyde took her own life with an overdose of Benzedrine in 1939 at the age of 33. Today she is considered one of New Zealand's major writers. Robin Hyde is currently considered a "single author." If one or more works are by a distinct, homonymous authors, go ahead and split the author. Robin Hyde is composed of 2 names. You can examine and separate out names.